Situated in the Pyrenees National Park, not far from the Spanish border, the ski resort of Peyragudes straddles the peaked mountains whose slopes roll down into the valleys of Louron and Larboust. Located in the departments of Hautes-Pyrénées and Haute-Garonne, in the Midi-Pyrénées, the resort was formed in 1988 by merging the two villages of Peyresourde and Agudes together. Today the larger of the two villages, Peyresourde is where you will find the majority of the amenities and some accommodation. It has developed into a modern purpose built resort, but still manages to retain its traditional welcome. Furthermore, the views from Peyresourde are amazing: taking in the beautiful Louron Valley below and the snowy peaks of Val Louron on the other side. A five minute walk away, at the entrance to the village is the small hamlet of “Balestas” where you will find the majority of the resort’s accommodation and the main Tourist Office. The local ski bus operates between the roundabout here and the ski slopes during the winter season every day. It is a two minute journey on the bus otherwise it is a five minute walk between the two. There is everything you need in the centre of the resort from ski and snowboard amenities to child care and on piste activities. Eating out at the bottom of the slopes or on the slopes is not a problem with a good and varied selection of restaurants. In the evenings many of the restaurants serve up great hearty meals and also double up as bars. The Col de Peyresourde (of Tour de France fame) is just a stone’s throw away - the drive up to the ski resort actually takes in a large stretch of the climb turning off to the resort just before the Col shows on the horizon. A new Spa and Wellness Centre will open this year in front of the pistes offering a wide range of spa activities and massages for adults (over 15 years). There are also other winter activities and amenities down in the valley at Loudenvielle such as the famed Balnea Spa and Wellness Centre. In the heart of a nature reserve, with east-west facing slopes the ski area of Peyragudes allows you to constantly ski in the sunshine, offering stunning views at the same time. It offers high quality snow coverage, high speed lift systems and challenging slopes for all abilities. If you fancy a day in the sister resort of Val Louron (on view across the valley from Peyragudes) then simply hop in the car or take a taxi to this small and intimate ski area atop the Col d’Azet. 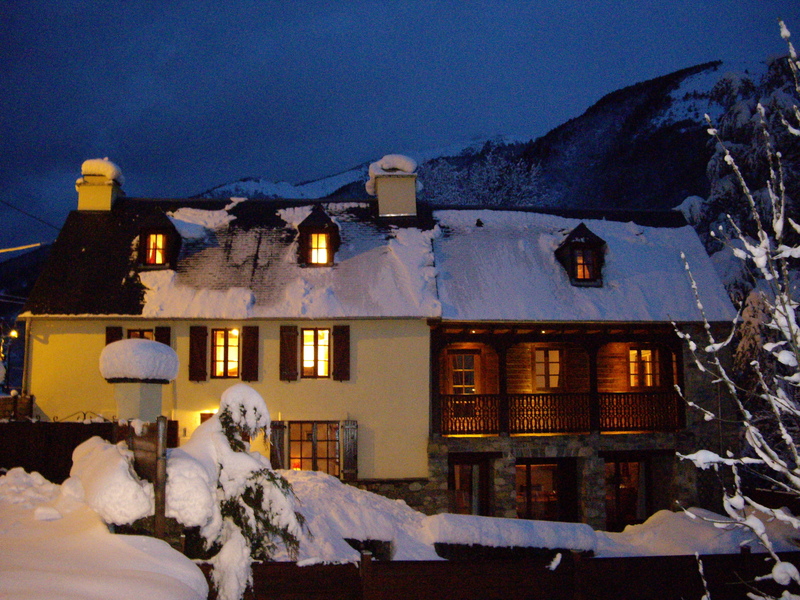 The friendly and helpful Maison de Peyragudes is open every day during the winter season, 08:30 – 19:00. Their comprehensive website is full of useful information, tips and suggestions. For those who prefer a real “Getaway” destination, this small village with its old narrow streets and small lake is picture perfect. The small church of Saint Blaise with its 16th century clock tower and the chapel of Saint Christau are all reminiscent of the history of this ancient village. It is just 6 km from Loudenvielle and 11km from Peyragudes ski area. This small hamlet has a couple of restaurants and a bar and is in the heart of the Louron Valley in an idyllic location. Peyragudes ski area open: 28/11/15 – 26/03/16. Garderie Peyragudes, Serias Building level -1, Peyragudes ski resort. The nursery welcomes children from 18 months to 6 years old (some places for children 12 to 18 months) and is located at the foot of the slopes in Peyragudes ski area. Les Marmottes, Residence Les Marmottes, Les Agudes. The leisure centre on the Agudes side of the resort has qualified staff that welcome children from 3 to 6 years of age on the slopes in Les Marmottes. Children aged 6-12 years can enjoy the unique experience of tracking wild animal footprints through the snow with a guide. This fun excursion also gives children a chance to try snow-shoeing for half a day, equipment provided. A generous games room equipped with table football, billiard tables, pin-ball machines and electronic arcade games. For very young first time skiers, Peyragudes offers learning to ski with qualified instructors on a dedicated and specially designed space for the little ones. The valleys of Larboust and Louron offer many outdoor and cultural activities, for adults and children alike, of all abilities, and have a rich rural heritage. Peyragudes itself offers a wide range of additional winter activities: the “Balnea” Spa and Well-being Centre, dog sleigh rides, torchlight descents, igloo building, snow shoeing, paragliding, rides on piste-bashers and a museum and cinema. Guided snowshoe walking is a wonderful way to enjoy the mountains in the winter. A great activity for all the family it's a great way to discover the Pyrenean wildlife and learn about the mountains at your own pace. Peyragudes offers three well-marked snow shoe trails, one of which goes through the forest, all of which are easy to negotiate without a guide. These are accessible from the resort (Peyresourde side) or from the Chalet "La Sapiniere". Equipment is included. Enjoy the thrill of the ‘Mush’ as you drive your pack of huskies around the Nordic trails set in the wonderful Balestas snow covered meadows. Get back to nature and the good old days with these ‘old fashioned snowmobiles’ as you live out your Antartic fantasy safe in the knowledge that a warm bed is never too far away. Options abound with activities to suit all abilities. The Cabanou is a mountain restaurant that was completely rebuilt last winter following a fire, and offers skiers a panoramic terrace for sunbathing and a central fireplace with a cosy and relaxed ambiance. Once a week (Thurs), the owners organise an evening meal with snowmobiling. Snowmobile drivers pick up their customers at the bottom of the slopes take them up to the restaurant where they enjoy a hearty dish of tartiflette before returning back to resort. Kids can enjoy the magic of a torchlight descent once a week with the ESF (French Ski School). A unique and fun way to experience the slopes with friends and family – we’ve never seen anything like it! Sledges are all identical and are assembled together to form a single train. Giggles guaranteed! Take a fun and exhilarating ride up and over the slopes in one of these all terrain vehicles as the resort staff set about preparing the ski runs for the next day. The ride gives a true insight into the work that goes on behind the scenes and often late into the evening. Drinks are also provided as part of the tour which you can enjoy on the ski hill. Ever wanted to have a freshly groomed ski resort all to yourself? Ever wanted to carve fresh tracks into virgin snow? Well, with the First Tracks Tour you get about the best opportunity to achieve these dreams that does not involve hiring a helicopter and remortgaging the house back home! Avoid the queues for the first lift of the day and take a ride up the slopes in a piste basher before the lifts open. Enjoy the serenity of the deserted mountain slopes and then the ecstasy of carving your tracks into freshly groomed slopes as you wind your way down to a deserved cup of hot coffee in one of the cafes in front of the slopes. The catch? There’s none – the tour is completely free of charge and operates on a first come first served basis! Disclaimer: Cup of hot coffee in slope side cafe is not included in the tour. Participants must have a valid lift pass and be able to negotiate red runs. Limited to five persons. A yooner is best described as a ski blade-sledge hybrid with a joystick for steering, using your feet for brakes. Still confused? Imagine a ski blade with a seat fixed to it (like a go cart).... still not helping? Perhaps the best option is to look Yooner up on the internet! It’s not an Olympic sport (yet), but it is lightweight, flexible and comfortable and as much fun to watch as it is to have a go. The resort is keen to promote snow safety both on and off the slopes and offers free courses to resort guests. Ever wondered how they produce artificial snow? What is artificial snow? Learn all about nucleating agents, environmental conditions and the various types of canons used to produce the snow crystals whose sole purpose is for your considered enjoyment on the pistes with a guided tour of the snow making facilities is provided by the resort. The resort also offers igloo building for children aged from 4 years old to discover the snow, and the mountain environment. Air-boarding is a fun activity, a bit like taking a punt down the slopes on an inflatable sledge. It’s ok to take the air board on the ski lifts – so you'll have no worries about getting back to the top of the slopes for more endless fun and excitement. 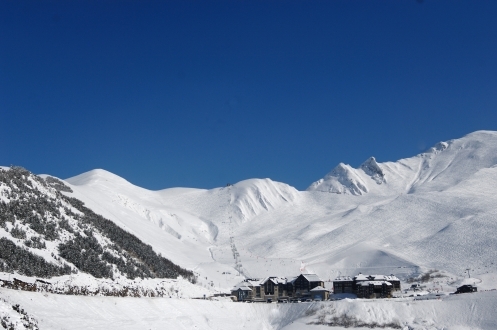 The ski area of Peyragudes has 2 mountain restaurants for you to choose from. From quick snacks and fast food for piste friends to relaxing dining with great views for those who operate at a more sedate pace. The Cabanou is a mountain restaurant that was completely rebuilt last winter following a fire, and offers skiers a panoramic terrace for sunbathing and a central fireplace with a cosy and relaxed ambiance. Once a week (Thurs), the owners organise an evening meal with snowmobiling. Snowmobile drivers pick up their customers at the bottom of the slopes take them up to the restaurant where they enjoy a hearty dish of Tartiflette before returning back to resort. Other themed days include duck confit on Saturday and a new evening, "Little Pigs," with suckling pigs. Snack bar based in the board park. Located in the ski resort of Peyragudes, at the base of the lift or in the resort village. 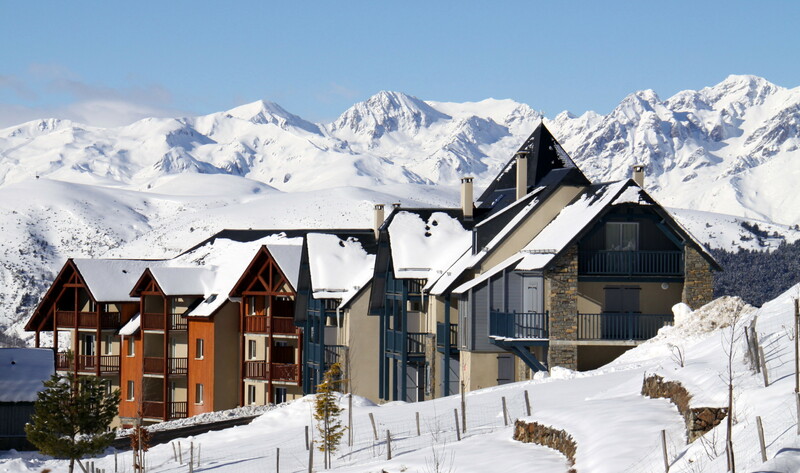 Residence Serias, 65240 Peyragudes, Tel: +33 (0)562 405125. Les Silènes is a snack bar that serves a selection of sandwiches and other tasty treats. 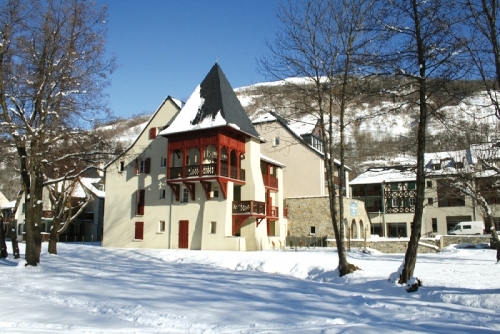 Résidence Le Louron, 65240 Peyragudes, Tel: +33 (0)670 958025. Peyragudes and the Louron Valley has nightlife to suit all tastes. Whether you like to enjoy a quiet drink with friends and loved ones or you enjoy the party atmosphere, the resort is full of friendly bar restaurants. So, if it’s an aperitif before dinner, a few drinks with friends listening to live music, or staying up late to dance the night away with flowing cocktails, Peyragudes has all the bases covered. 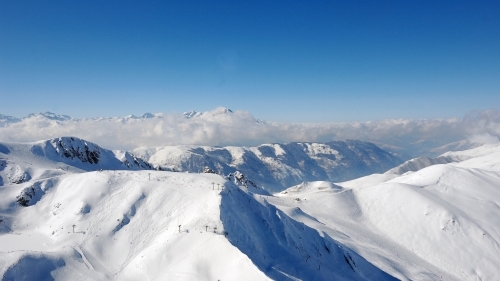 Shuttle buses run from Tarbes-Lourdes Airport to Peyragudes direct. If you are travelling from Stansted airport or Paris Orly on the Ryanair flight to Tarbes-Lourdes Airport on Friday or Tuesday. From 5 December to 17 April you can reserve your ticket for a single or return journey or purchase at the information desk at the airport at arrivals level. In resort, payments can be made on the bus to the driver in cash. Be aware though that places are limited so a reservation is advisable. If no reservations are made for the shuttle – it may not run. Distance to Peyragudes: 161km/ 100 miles, 1hrs 55mins. Access: Then bus to Peyragudes approx. 25km / 15 miles. A Spa and Wellbeing centre at the foot of the ski slopes in Peyragudes. Skiers can now take advantage of the slopes of the sister resort of Val Louron which is part of the new 'Neiges Louronnaises' ski area which offers an amazing 82km of slopes and a wide variety of terrain served by a modern high-speed lift system! See Ski Passes section for more information. 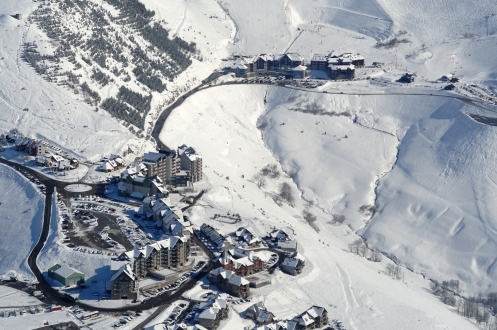 The ski resort of Peyragudes is situated in the departments of Hautes-Pyrénées and Haute-Garonne, in the Midi-Pyrénées. 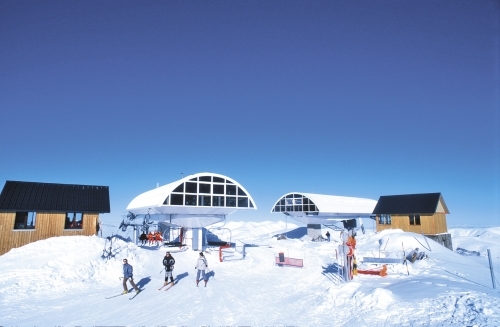 The ski resort, which lies at a height of 1600 meters, was created in 1988 when the Peyresourde and Agudes stations were joined together. The ski area is positioned in such a way so that it benefits from exposure to the sun throughout the day – this is probably something that harks back to the days when the villages were simple mountain pastures in the summer months. In the early morning the sun hits the slopes of the Agudes side of the resort before moving round to Peyresourde in the afternoon. 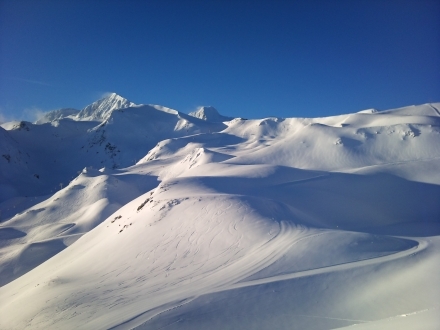 Peyragudes offers lots of varied skiing in a truly sensational setting, the surrounding panoramas are punctuated with peaks that rise to in excess of 3000m. With its high-speed, modern lift system, you are ensured the maximum amount of time on the doing what you enjoy the most! The resort has lots of slope-side accommodation for great access to the area that caters to all tastes and group sizes. For those that choose to stay in the valley down in Loudenvielle, Peyragudes can be accessed from the famous road that leads up to the Col de Peyresourde – there is plenty of parking at the base of the slopes when you arrive. A shuttle bus runs from outside the Balnea Spa to the slopes (see Access section for more details). Peyragudes has plenty to offer mixed-ability family groups and recreational skiers who appreciate a relaxed experience in pretty sensational, away-from-it-all surroundings. In addition to its relaxed, friendly environment and safe areas for beginners and children, Peyragudes also offers enjoyable blue runs and some challenging red runs with a few steeper blacks and some great off-piste possibilities. 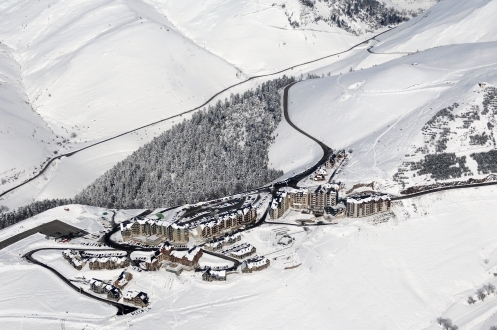 The snow record at Peyragudes is also reassuring which is part in thanks to its altitude, the precipitation and combined snow making facilities. The well-groomed pistes are served by a modern high-speed lift system, and despite what looks on paper to be a relatively compact size, the resort offers a real big-mountain feel with well-linked sectors. The nearby are resorts of Cauterets, Pont d’Espagne and Bareges (Grand Tourmalet), offer more downhill and cross-country skiing, snow-shoeing, walking, etc. 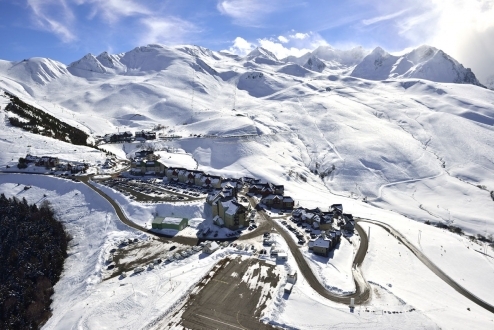 The ‘next generation’ winter resort of Peyragudes was formed by combining the villages of Agudes and Peyresourde which sit at either side of the Col de la Flamme; both villages are at an altitude of 1600m. Peyragudes is the Pyrenees’ most high tech resort and as such, the villages of Agudes and Peyresourde both benefit from high-speed, slow-boarding chairs that make it a dream for navigating the resort as a whole. 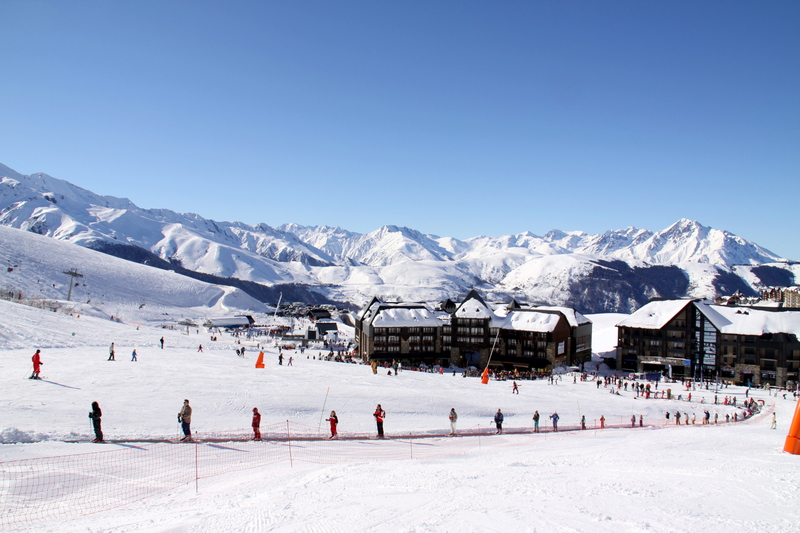 The resort rises up to a healthy 2400m at the top of the Serre Doumenge lift. 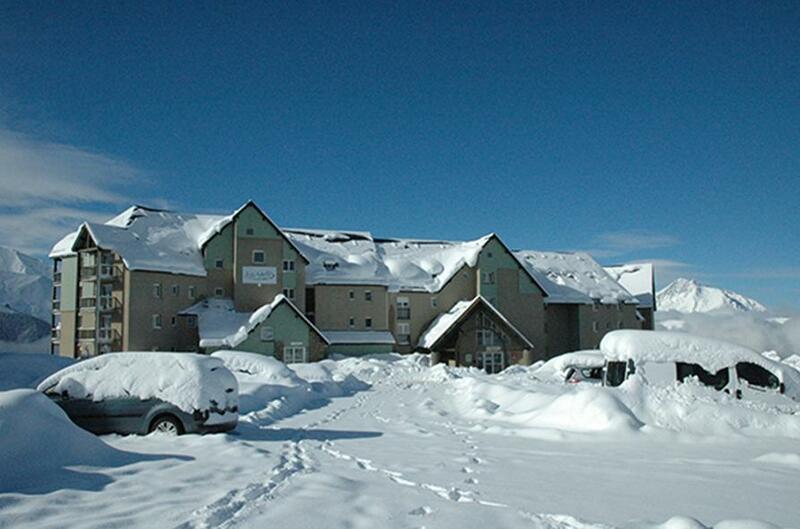 In an independent survey, the resort was rated highly on its suitability for intermediate skiers. Peyragudes has a good selection of blue and red runs that are well connected. The steep slopes of the resort also mean that it is popular with snowboarders and expert skiers. Don’t be fooled by what appears to be a relatively modest ski area as there are some challenging runs and endless off piste opportunities. Beginners have the choice of two areas – one in Agudes, the other in Peyresourde – where they can practice their new learned skills. Beyond the Grande Traverse, green runs are limited to the nursery slopes – although fast and confident learners will be rewarded with a good selection of well-linked blues. Situated just below the village of Peyresourde is the hamlet of Balestas. Here you will find more accommodation that is linked to the main villages via a shuttle bus service. It is also here that you will find access to the 15km of cross country skiing and snow shoe trails – there are three marked trails of increasing difficulty. The resort also boasts a snow park which is popular due to its sound system and snack bar with its panoramic terrace. The park is never too crowded and is designed for use by skiers and boarders of a wide range of ability and features numerous tables, hips, boxes, big airs and hand rails. There are dedicated beginners’ areas situated at the base of the Peyresourde and Agudes sectors. Both areas have ‘magic carpet’ lifts for young beginners as well as a drag lift for adults. The Peyresourde side also benefits from a 4 man chair. Once you’ve got to grips with your technique and mastered the beginners’ area and you feel ready to take on your first green piste, the best option is to take the Carrousel run from the top of the 4 man chair lift of the same name. If you’re feeling a little more adventurous, the Cabanou 4 man chair lift will allow you can pick up the Grande Traverse green run which returns to the base of the slopes. The Traverse is a rewarding beginner run with a relatively long and gentle slope with some amazing views. When you are ready to face the next challenge of your first blue run, the best place to practice is probably on the Peyresourde side as this has a higher concentration. The high speed six man chair lift of Serias will ensure that you get the maximum amount of time to practice your technique on the pistes from the top of the Col de la Flamme such as Dos Geant, Myrtilles and Pla de L’hougarte. The three blue runs are all interconnected so you need to pay attention to where you are going in order to arrive back at the foot of the high speed Serias. You can also access the Agudes sector from the top of the Col de la Flamme using a blue. The Cap de Pales high speed lift from the base of Agudes has some great options. However, the blue Traverse Isards from the top of the Serre Doumenge lift has the best options for long, cruising blues and interconnects with runs on both the Agudes (Cretes Duboum, Perdrix, Val Agudes)and Peyresourde (Aigles, Aiglons, Combe Magneras) sectors. There are a good proportion of red-graded runs, providing an attainable, confidence-building upgrade path for those who are ready to graduate from the long blue cruisers. Try the long, winding red descents with their stunning vistas from the top of the Cimes 3 man chair on the Peyresourde side and from the top of the Serre Doumenge 6 man chair on the Agudes side. Peyragudes as a whole, is well suited to intermediate skiers with a good selection of blue and red runs – something that was reflected in an independent survey. 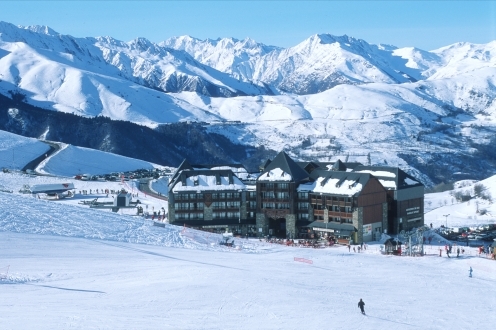 There are good connections to either side of the resort from the slope base using the Serias and Privilege high speed chair lifts from Peyresourde and the Cap de Pales lift in the Agudes sector. More advanced intermediate skiers can really enjoy the scenic runs and take advantage of the safe areas between them to perfect their powder technique. The Vallee Blanche and the Petite Vallee runs on the Agudes side are a must for the adventurous skier with lots of options for free skiing. Peyragudes offers some great runs for experts from the top of the Serre Doumenge, Cap de Bales and Privilege lifts. Those who enjoy a challenge should try the Pene Nere black from the top of the Serre Doumenge which then links into the Vallee Blanche. There are also numerous off-piste opportunities for the more adventurous. For those that like to experiment with the off piste, the steep slopes of Peyragudes are actually quite interesting for lift served off piste. Under the Serre Doumenge lift there are a number of variants which pass through saddles or between rocks before opening up to large snow fields that are often fresh with powder. The wind can often drive the powder into sheltered areas so the depth of the powder does vary. From the top of the Serre Doumenge, the blue-marked Traverse Isards offers many unmarked descents into the bowl and it is not uncommon to find fresh powder between the marked runs here. The Pene Nere black (again served by the Serre Doumenge) is a good source of off piste options for those willing to seek them out. A traverse from the Pene Nere to the red marked Traverse Estives offers steeps slopes and couloirs. From the top of the Privilege chair lift in the Peyresourde sector or the Cap de Bales in Agudes you can connect to the Eperviers black run. From here, it is possible to traverse immediately to the right to follow the contour just below the ridge. The obvious descent is the large off-piste down to Palombes blue. However, at the top of this slope you find yourself on a saddle. If you ski to the edge of the saddle you can see the Combe de la Flamme below and a wide and steep couloirs that invites you to join it! Depending on the snow conditions, the Vallée Blanche allows you can ski down for 5km to join the Luchon road where you can take the bus back to the station (high season). The valley is North East to North facing and so guards its snow late into the season. From the top of the Pene Nere, you can climb for a further 20 minutes to the Cap des Hittes to descend along the ridge then into the large north facing bowl. This is frequently dangerous with large slab avalanches forming on its slopes and those who are inexperienced should always use the expertise of a local guide. Alternatively, you can just stick to the black Pene Nere at the bottom of which you track left into the valley. There are a few red marker posts giving a guide to the route to be taken, although in reality it is much a case of finding the most skiable snow. The Val Lumieres on the Peyresourde side is a very similar proposition to the Vallee Blanche. 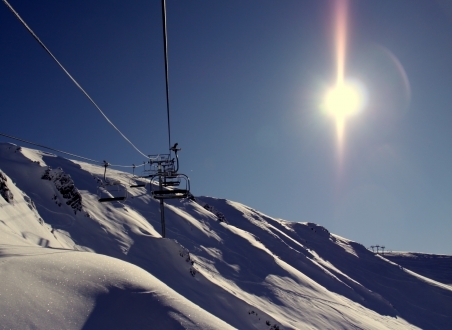 It is easily accessed by the lift system and is popular as it sits just below the mountain restaurant Cabanou. 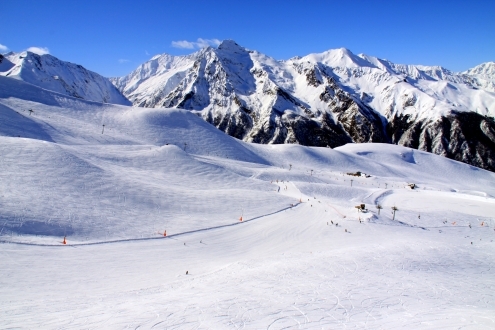 The Val Lumieres circumnavigates the extreme boundary of the ski area and its open pistes offer numerous options for fresh tracks and unchartered lines. Just like the Vallee Blanche on the Agudes side, Val Lumieres is a must. The run is approximately 5-6km in length and finishes at the hamlet of Balestas. From here you have to take the Plateau drag lift out of the valley – the only remaining original drag lift from when the resort was first created back in 1988. The resort does offer many opportunities to practice off piste skiing without the need for a guide, however, we would always advise to speak with and use local guides where possible. 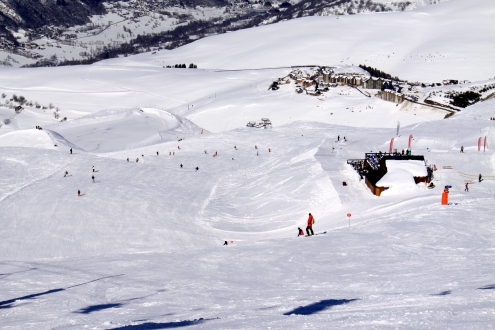 The snowpark at Peyragudes is situated at an altitude of 2000m on the Peyresourde side of the resort. It is popular with boarders and skiers alike but unlike some Alpine counterparts, never too crowded. The park features numerous tables (4-12m long), a hip, boxes and rails that are designed to accommodate boarders of all abilities. The park is also equipped with a ski lift and a chalet restaurant ‘La Suite’ where you can choose to eat your snack quickly and get back to the tricks or take your time and enjoy the view from the panoramic terrace. The park sound system ensures that you remain entertained as you practice your 180s and 360s. Boarders may also be happy to know that there are only 2 drag lifts in the whole of the resort. The steep bowls, with their predominantly red and black pistes offer great terrain where you can enjoy the scenic runs and take advantage of the safe areas between them to perfect your powder technique. Expert and adventurous boarders who like the freedom of freeride and backcountry should refer to the off piste section for further options. The cross country ski trails are located in the Balestas sector of the Peyragudes ski area. In total there are 15km of cross country ski trails. A new trail will open this winter (2014/15) from the bottom of the piste in front of the Privilege chair lift that connects up to the mountain restaurant Cabanou. Walkers and non-skiers will also find marked snow shoe trails in this sector that depart from the base station. The trails are marked in difficulty rating and range from an easy green circuit to a challenging red. Please refer to the Activities section for further details and guides. We have a conveniently located hire shops in Peyragudes and Loudenvielle for all your ski and snowboard equipment needs. We offer competitive prices and special offers are also available. Pre-booking your equipment hire will allow you to save precious skiing time once in the resort and means you can budget for your ski holiday, knowing that it is already book and paid for. Important note: free hands free pass included in the price. * Proof of age is required for Free lift passes. Please bring ID when collecting your lift pass. No photo required. ESF Peyresourde and its 50 qualified instructors are ready to welcome you to the Pyrenees and help you discover the joy of skiing. Passionate about their work, our state qualified professionals teach adults and children in all existing disciplines: skiing, snowboarding and Telemark skiing. The E.S.F also organises downhill courses and training in disciplines such as Giant Slalom, Special Slalom, Parallel Slalom and Boarder cross. To meet demand for increasingly need, the instructors speak several languages: English, Spanish and German as well as French, of course! Ski/Snowboard: Sun-Fri - AM 10.00-12.30 all season; PM 15.00-17.00 (12 children per group) and PM 13.00-15.00 (6 children per group) 21/12-14-03/01/15 & 07/02/15- 07/03/15 only. This Children’s skiing club caters for children from 4 – 12 years of age. The children learn to ski through playing, using specially equipped tow ropes to take them up the small baby slopes. The classes last 2 or 2.5 hours per lesson and are available on a daily basis or a 6 consecutive day’s basis starting on Sunday. The levels are shown below. Available during Christmas and February school holidays only from 09.00 – 15.00 with a ski instructor of your choice (availability dependant) private lessons give a one to one experience for personalised tuition at whichever level you choose. You can also take a private lesson for a group of up to 4 people, however you must all be at a similar level of skiing for this option to function.